A delicious new way to enjoy the taste of high quality Ghanaian cocoa bought from small-scale farmers on Fairtrade terms. Whether whisking up a rich dark cup of fragrant hot cocoa, or using cocoa in your favourite chocolate recipes, Divine Cocoa is the perfect choice. Suitabel for vegans. Why not bulk up and save money by buying a case of 12?! "We buy our cocoa from Kuapa Kokoo in Ghana, a farmers' cooperative that part owns the company and prides itself on the quality of its beans," says Sophi Tranchell, MD of Day Chocolate. "They are grown in the shade of the rainforest, carefully fermented and dried for a week in the sun, creating the full, rich, chocolatiness that gives the whole range of Divine products their wonderful flavour. For those who appreciate the pure taste of good cocoa, we are delighted to introduce our new Divine Cocoa, and offer yet another way to indulge in chocolate and ensure a fair deal for small-scale cocoa farmers." The Divine Cocoa - 125g product ethics are indicated below. To learn more about these product ethics and to see related products, follow the links below. This was purchased for a friend but I've used this product for many years. 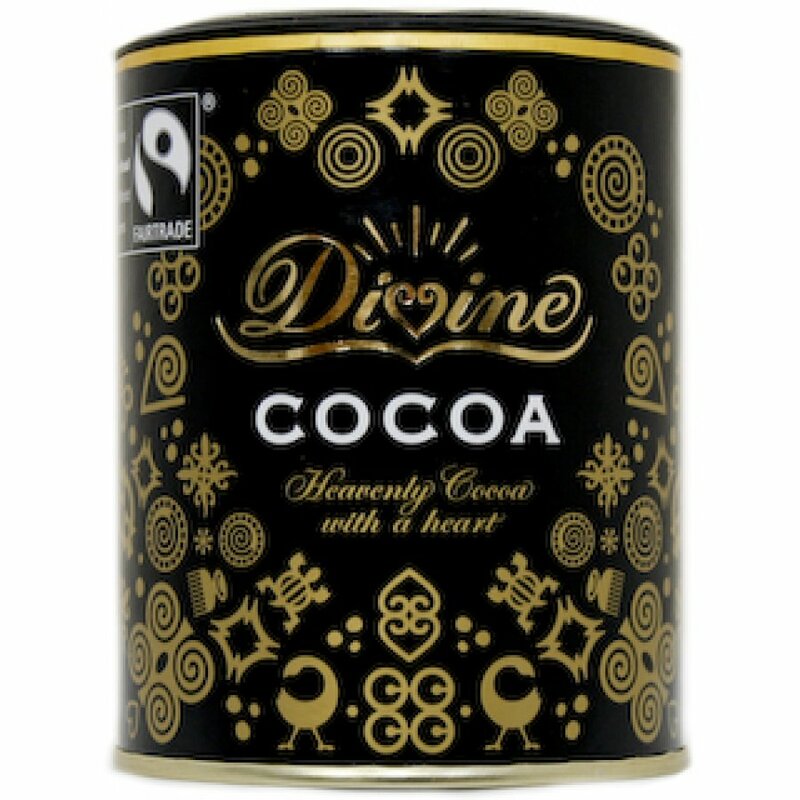 There are currently no questions to display about Divine Cocoa - 125g. The story of Divine starts back in 1993 with the birth of Kuapa Kokoo, a pioneering cocoa farmers’ cooperative in Ghana, dedicated to producing high quality cocoa, and running a democratic organisation with the farmer’s interests at heart. In 1997 Kuapa Kokoo made the bold move into the UK chocolate industry and The Day Chocolate Company was launched. Day Chocolate’s mission is to bring a delicious Fairtrade chocolate alternative to as many chocolate lovers as possible, and in so doing both raising awareness of the need for fairer trade with developing countries, and growing a market to ensure more cocoa is bought at the Fairtrade price. Divine Chocolate have a full range of chocolates with everything from the classic Divine 70% Dark Chocolate to Divine Joe & Sephs Milk Chocolate Salted Caramel Popcorn. 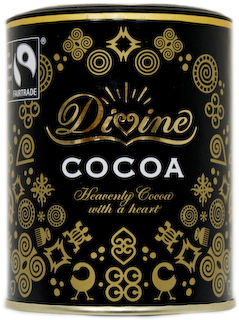 Divine, launched by Day Chocolate in 1998, is a delicious Fairtrade chocolate created to give chocolate lovers the opportunity to indulge in their favourite treat and support a fairer system of trade at the same time. The Divine range is constantly growing, ensuring there is something to tempt everyone, and there are always new and wonderful Divine experiences to enjoy. Divine and its sister brand Dubble are made with the best quality Fairtrade cocoa beans from Kuapa Kokoo farmers who own 33% of The Day Chocolate Company. This means they influence how the company is run and get a share of the profits. They are also ensured a guaranteed price for their beans and long term trading relationships which help them work their way out of poverty… That’s Fairtrade.